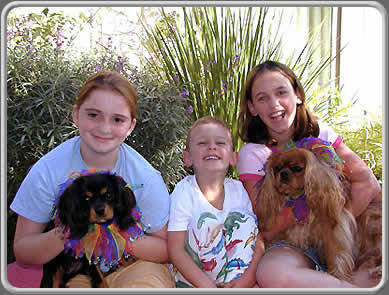 All four of us have lived with beloved Cavalier King Charles Spaniels who were severely affected with Episodic Falling Syndrome. It has been a motivating factor in each of our lives. Gathering and making available as much information as possible regarding EFS is a continuing goal. When Dorothie Hellman's Penny had her first episode, the only thing she knew was that it wasn't epilepsy. Finding answers was a struggle. She decided to create this site so that people would no longer have to search alone and would be able reach out to each other. Barbara Reese has been collecting data on EFS affected dogs, including pedigrees, for 35 years, since she lost her beloved Gracie. She continues to work to raise awareness and maintains her own website with information on Episodic Falling Syndrome. She has lectured on EFS in the United Kingdom. Episodic Falling Syndrome has been a life's work. Christa Krey has bred Cavaliers for over 30 years and has carried out a ten year test breeding program to determine the mode of inheritance of Episodic Falling Syndrome. This has been a sometimes heartbreaking but rewarding undertaking. She has also assisted her local University in the teaching program for veterinary students. Christa did a long term test breeding program and provided many of the samples that were used to develop the DNA test for EFS. Tina Whittaker has owned Cavaliers for 30 years. Six years ago she picked out her Amber in hopes of showing her. When Amber showed her first symptoms of EFS at twelve weeks old, Tina took up the effort to bring attention to Episodic Falling Syndrome and the effect on our breed. She added information on her own website to help in that effort. We also look forward to your comments, suggestions and additions on the Facebook group. This is the only way we can assure that, not only does the web site and Facebook group meet your needs, but is as accurate and up to date as possible. Please feel free to contact us on Facebook.